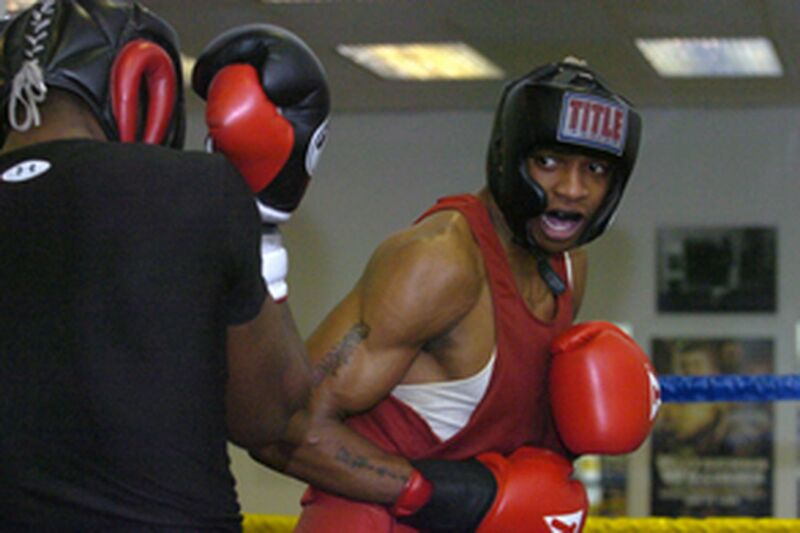 Derrick Webster (right) spars with LaJuan Simon at Joe Hand Boxing Gym. It took 18 years for Derrick Webster to see his father for the first time, but he never imagined it would be for the last time. There were too many questions Webster wanted his father, Derrick Sr., to answer. They had spoken on the phone, but never face-to-face. Painfully, those questions would have to remain unanswered forever as the first sight Webster had of his father was inside a casket. "I couldn't even touch him because his skin was so soft from the water," said Webster, referring to the day he saw his father inside a funeral home in Beckley, W.Va., 6 years ago. Derrick Sr.'s body had been found on the banks of a local river 3 days after he was slain after leaving a party. As difficult as it has been for Webster to deal with the loss of his father, it has only made him tougher inside the ropes of the boxing ring. Saturday, Webster will fight an opponent to be determined in one of the 12 bouts scheduled for the Pennsylvania Golden Gloves Eastern Regional championships at the New Alhambra in South Philadelphia. Webster is the cousin of two-time heavyweight champion Tim Witherspoon and 2004 Golden Glove heavyweight champion Chazz Witherspoon. A novice-class fighter at 165 pounds, he is 5-0 in his brief career, with four knockouts, but he shows no modesty in pursuit of adding to his undefeated record. "It's the regionals this week and it's in my gym, I have to go hard," said Webster, a Clementon, N.J., native who trains at the Joe Hand Boxing Gym in South Philly. "I don't care who I'm fighting, I plan on lighting a fire up under somebody this week." Growing up, Webster didn't have an interest in boxing. After starring on the Glassboro High basketball team, Webster played at Salem (N.J.) Community College. On the junior-college level, he impressed several Division I schools, including Maryland. But just as he was about to pursue an opportunity at Maryland, he learned the news about his father. At that point, there seemed to be nothing left for Webster. It was not the only time he had to deal with the loss of an influential person in his life. When he was younger and had aspirations of becoming a singer, a friend who was managing him also died. Then, after he became a fighter, his first trainer passed away. At the point of his father's death, Webster's world was empty, until he took a swing at the body bag. "Boxing was like my change of life," said Webster, 24. "I was looking for something more positive to get away from all the negative things that were taking place in my life and I found that in boxing. It ended up being an escape from somewhere I knew I didn't want to be down the road." Webster's trainer, Wade Hinnant, said the majority of the kids he trains at Joe Hand's often use boxing as an escape from their everyday troubles. "In Derrick's case, with the absence of him not having a father and really the type of family he felt he should have had, he comes to the gym and feels a good sense of camaraderie," Hinnant said. Webster, a 6-4, 165-pound southpaw, credits a lot of his development to his cousin Chazz, with whom he often spars in preparation for a fight. He said he benefits from training with a bigger fighter like the 230-pound Witherspoon. "I take much of my punishment in training," Webster said. "I don't take punishment in the ring during a fight; that's why I come back and thank guys like Chazz and my trainer for pushing so hard beforehand." Hinnant said the Golden Gloves probably would be Webster's final competition at the novice level before advancing to open class. Webster admits he knows the road is only going to get harder, but considering the road he's traveled thus far, he's more than up for the challenge. Because of Webster's natural athleticism, Hinnant believes he is far ahead of schedule in becoming one of the more elite boxers in the tristate area. However, Hinnant doesn't want Webster to get too ahead of himself and forget the little things that have gotten him this far. "I think Derrick has a lot of natural ability, but sometimes that can be a detriment because a lot of gifted athletes will depend on their natural abilities as opposed to sticking to the fundamentals," Hinnant said. "I think he's doing really well right now. With his height and being a southpaw, he really has an advantage over a lot of fighters, which is one of the reasons I think we can move him up so soon." Webster said he wants to get to a point where he demonstrates so much aggressiveness in the ring that creates a fear factor. "I know I'm capable of a lot of things, but at the same time I know I can't master the big things until I accomplish the little things," Webster said. "You have to crawl before you walk."